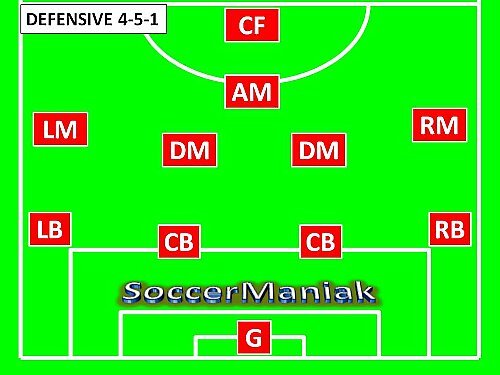 4-5-1 Soccer Formation is a very defensive minded system of play and not that many teams use it as a starting formation in a match. 4-5-1 formation in soccer is usually used if the team needs to draw a 0:0 score or has the lead in a match and wants to keep it. This soccer formation will crowd the midfield and defend with 9 players. When attacking, 4-5-1 soccer formation is at a disadvantage because of the lone forward playing against 3 or 4 defenders making it close to impossible for the forward to find space. This 4-5-1 system of play offers a more defensive and closed down style of play by playing with two defensive midfield players in the center of the field. The outside players will not have much effect in going forward and supplying crosses since the forward will have very low chances at heading the ball next to 3 or 4 opponent defenders. This formation should only be used if the team has the lead in the game or if playing against a much better team that plays very attacking style of play. Players should learn to verbally communicate and avoid overcrowding the midfield. Midfield should spread out in the middle and help each other close down empty space. This 4-5-1 formation in soccer offers defensive minded style of play with defensive midfield player helping the defense and the two center midfield players helping the lone forward. Outside midfield players (RM & LM) will make runs down the sides, however crosses will not do much good if there is only Forward player inside the opponents penalty box. This is where it will be important for the Center Midfield players to join the attack and run inside the penalty box for crosses. This 4-5-1 soccer formation offers a more attacking style of play with defense defending with at least 5 players at all times. With this formation Outside Backs (RB & LB) will be more defensive minded players that will not go up the field to support attack but will instead have all defensive responsibilities. One midfield player will play defensively while two center midfield players will play more offensively. The defensive line of this formation in soccer will consist of four players spread out across the defensive line with two Center Backs and two Outside Backs (RB & LB). Center Backs should be tall, strong and very good in the air. They will have to be great at defending in 1v1 situations and their verbal communication needs to be at its best because they are the backbone of defense and last two players in front of the goalie. Communication will ensure that all empty space is closed down and that defensive line steps up in sync for offside traps. Sweeper will be the player that reads the game better and he will have the advantage of doubling up on any player or play since he is positioned behind the defensive line. Outside Backs (RB & LB) will also have to be good at stoping players in 1v1 situation. Outside players are usually quick and agile. This system of play will not require Outside Backs (RB & LB) to go up the field for support, instead they will go up to the half way line and hold their position there allowing the Outside Midfield players to take side of the field during attack. This soccer formation strength lies in the midfield. Unlike other formations, this system of play attacks with possession of the ball and short passing therefore midfield players need to have great ball handling skills and strong passing ability. They will want to move the ball around and make the opponent chase the ball while getting closer and closer to the the opponents penalty box with simple passes. Defensive Midfield players are also called Holding Midfielders and their job is to control the center of the field by disrupting the opponents attack and also connecting the defense with offense by being the start of most attacks. 4-5-1 soccer formation Defensive Midfielders need to be DESTROYERS on the team. They have to be good in the air, great at defending 1v1 and have the ability to read the game very good. Defensive midfield players are strong and physical players not afraid to go for loose balls and tackle hard. They need solid passing skills and the ability to stay calm when the ball is passed to them because they will act as connectors between defense and attack. Center Midfield players or Attacking Midfield Players in this soccer formation need to be in great conditioning shape because of constantly running up to the field for support to Lone Attacker and than quickly running back to form the 5 midfield defense when the ball possession changes. Players in this position will have great vision of the field, read the game well, great ball control, exceptional passing and quick decision making skills. Players in this position will move from their own penalty box to their opponents penalty box. Outside Midfield players (RM & LM) will share the same qualities as the Center Midfield or Attacking Midfield players mentioned above. Since this formation does not attack from the sides but instead builds the attack through short passing and out numbering the opponent, Outside Midfield players do not need to be quick and agile but instead they need to know how to shield the ball and make quick decisions in passing the soccer ball. These players will favor to playing with their strong foot. 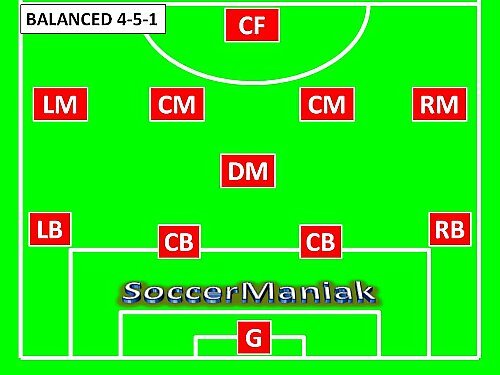 4-5-1 soccer formation is a more defensive formation and the lone forward has really small chances on taking on defenders and scoring since he is greatly outnumbered. Forward player in 4-5-1 soccer formation needs to be preferably big and strong point man that will win air balls and shield the ball waiting for the midfield to join. He will be the type of player that needs only one chance to score and is very hard to take the ball from. His job will be to receive the ball and be able to guard it against minimum of two defenders for 10 to 15 seconds or until the midfield shows up for support. Attacking with this soccer formation is best to do through short passes and outnumbering the opponent. Be patient and move the soccer ball with players playing one or two touch soccer. Passing and moving is key to success. Counter attack is a good way to surprise your opponent since they will have to push up with extra players to have any chance of keeping possession in your half of the field. Defending is done by simply not overcrowding the midfield and spreading the five players wide across the field. Do not chase the ball but instead communicate with players to take over defending different part of the field. There is a minimum of 8 defenders that will need to defend at all times. I hope you have a little better understanding of this soccer formation after reading this article.